Someone’s having a bit of a stubborn moment. So! No update for two weeks, then I’ll be back to post the next page on Thursday 23rd November, which happens to be Thanksgiving Day in the United States. 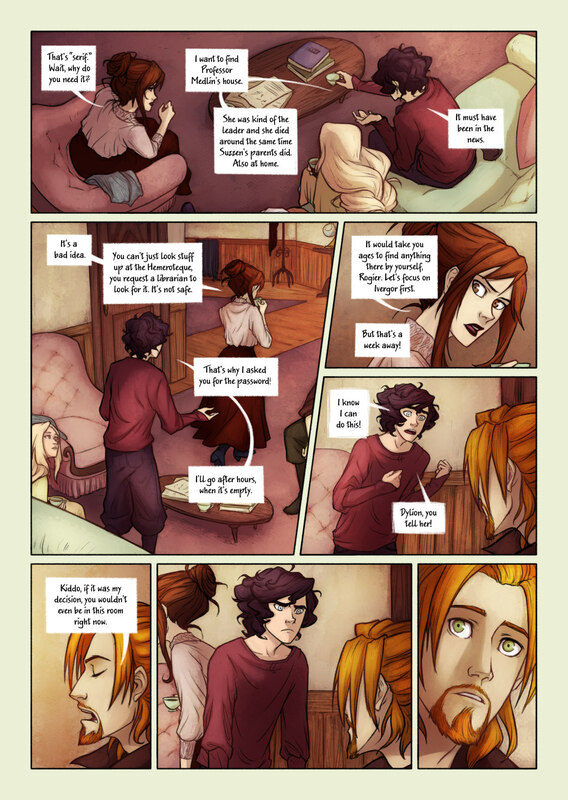 Even so, I’ve decided I’m going to post on that day to remind everyone about Sunday 26th November being Bookwyrms’ second anniversary! 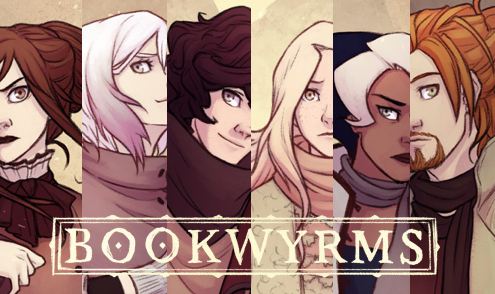 The new support wallpaper will be available that day, and there will be a draw among the people who help spread the word about the comic, where the winner will get a full body illustration of themselves as a character of the Bookwyrms universe! More on this will be revealed with the 23rd Nov update, so stay tuned if you’re interested! By the way, the new wallpaper is ready and here’s a little teaser! There’s also a new Halloweeny featuring Arabelia and Dylion in the Extras section, and new fanarts! Adorable Suzzen by Hawk, as a lovely birthday gift (my birthday was last Monday) and a beautiful portrait of Hedy, by Helia. Thank you both so much! 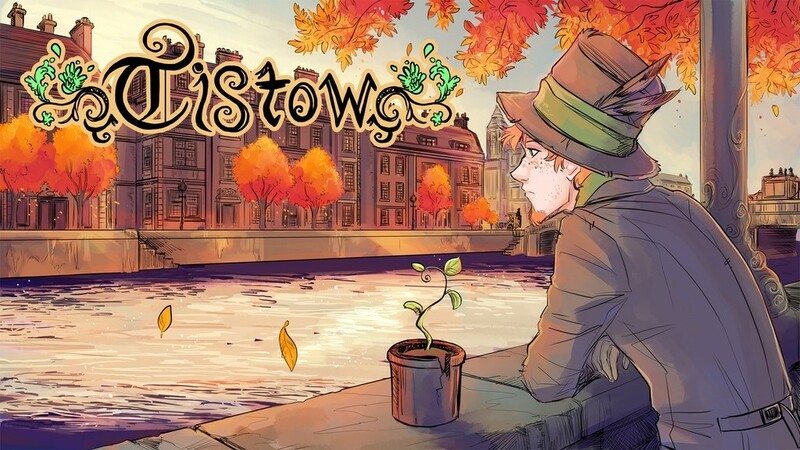 Also, also, you probably know Tistow by now, it’s one of the comics in the banners section next to the comments! Well, it just started a Kickstarter campaign to fund its first issue and well, its success has been mind-blowing! So be sure to check it out! Hi Elli! I just started reading you comic Tistow, and would love to comment, but I think you may have the settings for guest commenting off. Would it be possible for you to change that? Thank you! Oh my world, thank you so much for letting me know! It took me a while to find the option, I wasn’t even aware that was a setting Disqus had. Gee, I can’t say how thankful I am hahah. ♥ It’s changed now! Of course! I’m so glad you could find the setting, and I’m excited to comment! Small Trolls is beautiful and I felt terrible not being able to praise your work. Planning to wander through libraries at night, looking for dangerous knowledge? Well, you better have an invisibility cloak. Awww, he’s WORRIED about you Rogier. Stop doing dangerous stuff! I’m so super excited for the wallpaper and that draw!! I’m so in! Ok… as I’ve mentioned at least 50 times, I love this comic! It’s really interesting and while some may argue that there is not a lot of action and therefore not that great, I love character buildup, and detail, so it’s just GREAT for me! However, I really want to congratulate you on your improvement in your drawing! You have always been an incredible artist, but your detail and consistency in all different angles and facial attitudes has been fine tuned to perfection, and your improvement from the beginning of the comic to now is really incredible to see. It’s not very noticeable, but I feel the drawings have just gotten better and better in every aspect. I’ve been wanting to comment on it for sometime now but just hadn’t gotten the chance. I can’t wait for more Bookwyrms! Oh my, thank you so much for commenting on that!! ♥ It’s something I’m very happy about, the fact that I can see improvement in the drawings and in the way I present the story. Even if that means recognising lots of mistakes in the first pages, haha! But it really makes me happy that you also appreciate that ^^ Thank you for your kind words, I’m so glad you enjoy Bookwyrms that much! Desde mi posición de lega en la materia diré que me gusta mucho la perspectiva de la primera viñeta. Tiene que ser súper chungo dibujarles en esas posturas. En la página 141 el sofá blanco me parecía un poco grande en relación a los personajes (demasida profundidad) pero aquí los muebles están perfectos. Tiene que ser complicado guardar las proporciones tanto entre los personajes como entre estos y el entorno. ¡Muchas gracias! Sí que es de lo más complicado para mí, guardar siempre las proporciones entre todos los elementos. Me cuesta más que las perspectivas forzadas, diría incluso. Love how you draw expressions and different angles of a person’s face like Suzzen’s face in panel 2. I’ve seen it before, especially with Suzzen. It brings your characters to life and elevates your webcomic. I happen to vote for Bookwyrms daily and the only reason it hasn’t a good ranking is it’s not well known enough. That and the hordes of pubescent boys voting for the raunchy comics. It’s a pity more don’t know about Bookwyrms.